Welcome! 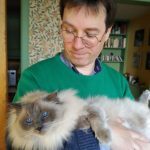 I’m Julian Smart, the author of the Jutoh ebook editor, and this is where you can find posts describing the software and what you can do with it. You can find more information by downloading the free Jutoh book, and also searching the many built-in topics by typing into the Jutoh toolbar. I’m technical director at Anthemion Software, located in Edinburgh, Scotland. As well as writing Jutoh, I developed the writer’s creativity toolkit, Writer’s Café, and a tool for wxWidgets programmers called DialogBlocks. I founded the popular wxWidgets user interface programming toolkit in 1992, now an open source project used by companies large and small. My wife Harriet Smart writes historical mysteries which are, of course, authored with Jutoh. My interests include Georgian chairs, William Morris, Vaughan Williams, and pandering to our Ragdoll cat Alfie.